﻿I cannot even believe it. 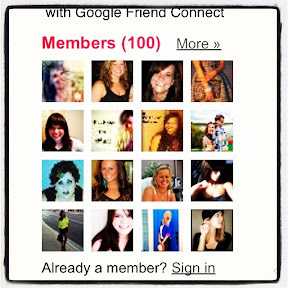 After almost three years of blogging, I hit 100 followers!!! It's insane to me that there are 100 people out there, probably about 85 who I don't even know IRL, that read my sporadic ramblings and life updates. I started this blog in March of 2009 when a lot of big changes were happening in my life. Read my first post here. I honestly don't even know how I got started on reading other people's blogs, but my subscription list was growing and I thought, "This would be a great way for me to chronicle my journey and let my family members in on what is going on in my life." And so it began; Breezy In Bloom. Since then I have experienced cohabitation, becoming a homeowner, getting engaged, becoming and auntie, getting married, and many other smaller milestones along the way. I am so glad I started blogging so I can look back on these important life moments and remember how I was feeling at that time. I also love the fact that I have "met" so many new people through this community. People who don't blog never get it. I try to explain it to them by comparing it to a pen pal, but they still look at me like I am crazy. My husband thinks it's weird that Raven and I text non-stop all day and night, and that I talk about people like Erica, Shay, Steph, and Katie like they are people I actually "know". People put their heart, soul, and lives out there for you in this community, so it's kind of like you do know them, even if you have never met face to face. Over the past three years I have struggled with figuring out if I want this space to be more than just a journal for me. I see a lot of blogs that do give aways and product reviews, and most of the time, I skip past them. I don't think I will ever be a blog that has sponsors, but never say never, I guess. I was always conflicted with wanting to grow my reader base and not wanting the responsibility of having to blog every day. Somehow I got here without posting every day (sometimes only once a month), so I guess I will just keep doing what I am doing and see where it goes from here. So welcome to all the new folks that have started visiting this little blog of mine! You have re-energized my passion to keep updating my space here. I still have a lot to learn about blogging, and it seems things change every day, but I'm gonna fake it 'til I make it and hopefully you stick around. You can also follow me on Twitter, Pinterest, and Instagram. You know, if you want to (you do). woohoo! in no time you will have 1000 peeps!! go girl go girl goooo!! things alllwaayyys change on blog land! but be true to yourself, which you is!! and alllllll will be fab my love! "When Are You Having Babies?"